Hi Everyone! 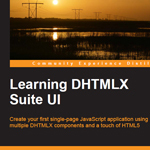 I am really pleased to announce the release of the technical book called “Learning DHTMLX Suite UI”. It covers the basics of the DHTMLX Components Suite and walks you through building a single page application using multiple components. I really see two audiences for this book. 1. Intermediate Web Developers looking to quickly add more tools to their bag and start making robust web applications. 2. Advanced Developers who have no knowledge of DHTMLX and want a quick crash course on syntax and some tricks. With that being said there are many ways of approaching an application. This book get’s straight to the point leaving out complex coding patterns and focuses on initiating the components using JSON and tying them together with events. Packt Publishing and I started working on this book in the spring. Squeezing in what little free time I have available between projects and life, Packt Publishing and I provided some excellent content in a short time. Having never written or published a book before it went really smooth and really excited that it is now available at many book providers like Amazon in printed version or ebook. The book goes through a light user management system to show how to tie together DHTMLX’s many UI components. They include the Layout, Grid, Form, Windows, Charts, and Calender (date picker). Many books require server side database installation and code just to store data when knowing all this is not necessary for learning UI components. We came up with a cool solution to save the data easily so the book could focus more on using the components. We did this by using a some what of a data access layer using client side localStorage. Each component updates on events to refresh the data in other parts of the screen. I don’t want to give out too much information and spoil the book! The cover photo was taken during sunset from a levee wall adjacent to the Florida Everglades behind one of my favorite parks, Markham Park. Excellent and challenging mountain bike trails! Thanks to Govindan K and Mrumayee Patil for their hard work in getting this book out. It has been a pleasure working with them. 0 Responses to "Learning DHTMLX Suite UI Book"